Dream Pod 9: Kickstarter Update: Steel Mold Plates Photos. This week we have a progress update on the steel mold plates for the plastic injections molds. The company making the molds sent us some early progress photos of some of the steel mold plates. The image below shows the first step in making the molds plates, where they use a Computer Numerical Control (CNC) Machine is used to rough out the mold cavities. There is an photo of the CNC Machine cutting one of the mold plates at the bottom of the image. This removes most of the excess steel, but does not do the fine details in the parts cavities. Each mold will have 4 of these plates with two on each side to make the four plastic model sprues in the mold. The next step to get the fine details uses an Electrical Discharge Machine (EDM), where positive versions of all the parts sprues and made in carbon and used to burn away steel. Several EDM passes will be done to remove all the steel and leave the finely detailed mold cavities that the hot plastic will be injected into to make the final model sprues. 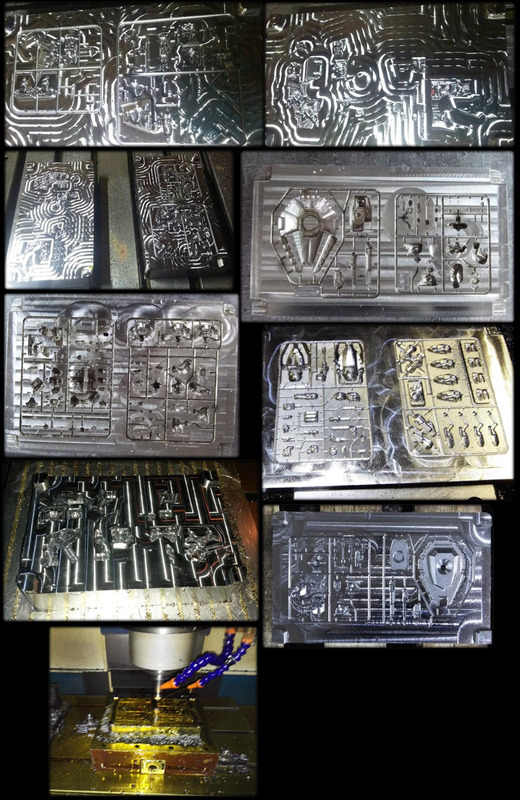 When we have photos of the finished mold plates we'll do another update post to show how they turned out. Home › Blogs › Robert Dubois's blog › Kickstarter Update: Steel Mold Plates Photos.